As a child, I was what you’d call a bookworm, in the most extreme sense. I blew through thick novels like Anne of Green Gables in second grade and often started a book in the morning over breakfast, finishing it by the time I clicked off my light at night. I read anything and everything I could get my hands on. I’m not using hyperbole when I say that in elementary school I went through thousands of books. In high school, my speed reading lost a bit of it’s steam. I became more involved in school and extracurricular activities and reading for pleasure became a little bit harder to fit into my busy schedule. Still, I managed to find time to discover new favourites and reread old ones. I even had reading traditions, such as reading 3 classics at minimum each summer and reading the Narnia series every Christmas break. Until now. Now, I am in university. I’m a bookworm in hibernation, wound up in a cocoon of textbook readings and frazzled study sessions. I have not read a single book that wasn’t for school purposes since I moved to Ottawa. And that my friends, is a problem. Long awaited and much anticipated, the Christmas holiday finally arrived. 3 full weeks where I could spend whole days drinking in inky pages and downing mugs of hot tea, should I so desire. Now, let’s be real. I’ve been working over the break. I’ve had umpteen family Christmas party commitments. I’ve been sleeping more than is necessary for any one human being and grabbing coffee with as many old friends as possible. And yet, falling snow and spare time have become the perfect setting for diving into my bedside table book stack. I swear, I’d somehow forgotten how enthralling it can be to lose yourself in a story. I might have kind of sort of…stolen this book. Or at least temporarily adopted it. A friend had left it in my room a few days before I came home and when I was packing to go, I threw it in my bag on a whim. I figured, if it was his favourite book, I should at least give it a chance. I kid you not, I opened it as soon as I sat down in the terminal to wait for my train. By the time we pulled into Union Station in Toronto, I’d eaten up more than half the pages. The Bell Jar is not a happy book, I can tell you that. It’s beautifully descriptive and yet very blunt at the same time. It’s sad. Really sad. And yet, hopeful at the same time. The last chapter is open ended; the reader can choose to belief the best for Esther’s future or the worst. It made me think and it made my heart ache but most of all, it made me glad to be alive. Because even though there is deep sadness in the world, I still breath every second. To be brutally honest, I wasn’t expecting much from Connor Franta’s debut book. My sister is the definition of a YouTube fangirl and in an attempt to show interest in her hobbies, I know my fair share about the whole community, fandom or whatever you want to call it. But I find that many celebrities write books just because they can; they often don’t actually have much to say. Connor’s book was a breath of fresh air. First of all, it’s extremely aesthetically pleasing. The cover, the photos, the font, the layout, it really is a beautiful book. But hey, we’re talking about reading here! To cut it short: it was good. He’s funny and has a strong voice that carries throughout. I actually really loved the writing and was so impressed with the clear amount of effort he put into making this book great. His antidotes are interesting and his honestly is relatable. Kudos to you Connor Franta, you caught me off guard! A Work in Progress actually turned out to be a really fun read. Yes, I know I should have gotten around to reading Lord of the Rings sooner. No, I don’t regret having waited until now. Why? Because reading a good book for the first time is an experience you never get back. A first reading is something to savour and enjoy because you’ll never be fully surprised by every plot twist and storyline again. Lord of the Rings is, so far, all it’s cracked up to be. It really is an adventure, which as you all know is something close to my heart. I’m just about halfway through right now, having put it aside to type up this blog, and tomorrow I’m planning to go sit in a coffee shop downtown, and loiter, drinking tea in a big armchair until I’m through with it. It’s been too long since I’ve spent hours truly abandoned in a story, allowing myself to forget what’s going on around me. I’m grateful this holiday for the world Tolkien created, and that I have time to immerse myself in it. One of my favourite things is all the little rhymes, poems and songs. They make the world seem even more real, like it really does have it’s own folklore and culture. So as you can tell, my little bookworm heart is in holiday heaven. I haven’t read a crazy amount, but enough to make my heart happy and to give my imagination the chance to stretch out and shake away the cobwebs. And to top it off, I got Chapters gift cards for Christmas so last night I went on a little spree. I love, love, love C.S.Lewis. I’ve been meaning to read Mere Christianity for a long time and now that it will have a home on my bookshelf back at school, I’m hoping I’ll have time to read it soon. Another long awaited read. And another adventure story, though this one really happened! I have an absolute fascination with “thru-hiking”, the practice of walking a long trail all at once, over the course of several months. My friends tease me that when my future husband proposes to me, I’m going to say yes on the condition that I get to spend 6 months hiking the Appalachian Trail first! I’ve been waiting for a soft cover (less expensive) copy of Bryson’s recounting to come out for ages. I’ve just now while writing this realized that all three of these books are non-fiction, rather unusual for me. This book is the wild card, one that I picked up off the shelf just because the cover reminded me of Three Cups of Tea, a book I love. It’s a true story about women in Iran meeting in secret to read forbidden classic novels and something about it just made me feel like I had to get it. I guess we will see. Like I said, I seriously love mail. I love sending it, I love getting it, I love decorating the envelopes and writing to people I care about. These cute notecards I picked up say “Have a ridiculously amazing day!”and I can’t wait to surprise my friends and family with a little bit of happy encouragement this semester! And just because my deprived bookish brain hasn’t been able to get enough of beautifully strung together words, I’ve been binge reading blogs left right and centre. Some of favourites this week have been Life as a Dare, Ordinary Adventures, Rose and Bliss, A Journey I Call My Own, You Make Something Out of Nothing, and Untidy Grace if you want to see what I’ve been reading! Well, that’s about all for now. To any other bookworms and book lovers out there, here’s to another great adventure, another world, another life, another read. I’m off to find a cozy nook to hide in. I simply must find out what happens to Frodo, Gandolf and the rest of the gang. p.s. how cute is my dog with his teddy bear?? They say life imitates art…and in the case of the newest Hunger Games instalment, Mockingjay Part II, the real life connection hit a little too hard. Sometimes I think that I think too much. I can never managed to completely zone out and focus on one thing, I always have a million secondary thoughts chasing around my brain, cross referencing with each other. So when I watch movies, I sometimes have a hard time disconnecting from all those thoughts and just watching the dang movie. As I’m sure most of you know, the Hunger Games is an extremely popular movie franchise in a dystopian world called Panem. The heroine of the story, Katniss, finds herself the centre of a rebellion…and soon enough, a civil war. The 13 districts, tired of facing an oppressive government are fighting to free the people and establish a democracy at any and all cost. For myself, as a student of development, the story of this fictional society rings all too true. This past semester, my discussion group had an interesting discussion about democracy. Democracy is considered a vital part of development but political reform comes with consequences and conflict, which makes it a difficult topic to figure out. My peers and I went back and forth for over an hour and couldn’t come to an agreement about a) whether or not these changes can be made without war or b) if the answer to a is no, is that conflict worth it? I still don’t have an answer to this question but the Hunger Games had me thinking about it again. As I watched the war in the movie unfold, I couldn’t help but cringe. Here I was, sitting in a theatre, on a “sister date” after months of being away from home and watching people kill each other…for entertainment. I don’t know, I guess I just didn’t think it was fun anymore, sitting and watching Katniss fight for her life. It gave me chills to know that thousands of kilometres away, people were hiding out for real, worried about being blown up or tortured, praying that their children won’t be taken away. The movie continued and I realized something, in the dark of the theatre (while I should have been mindlessly consuming media); there are no winners in war. It doesn’t matter how valiant the cause…war is war. It is violent and dirty, it corrupts good people and makes my heart ache. There are always people who die from being in the wrong place, there are always innocents killed in the crossfire. There are no “good” outcomes. Only ones that are less horrendous. This post isn’t about violence in the media, nor is it necessarily about being grateful for what have. It’s just something to think about. We were born into a place where we live with freedom from fear, a place that has never known war in our life time. But we do reside in an era of globalization, which means that we cannot close our eyes to the things happening around the world and pretend they don’t affect us, that people we don’t know, don’t matter. Maybe I should have just watched it and enjoyed it for what it was: a movie. But I can’t, that’s not me. I thought about all the ways it related to the world, to my life. When the movie started showing the refugees fleeing their homes…when it showed their children being bombed (by the “good guys”) in order to gain leverage, all I could think about was the Syrian refugees. I’ve been pretty quiet about the whole refugee “hot topic” when people bring it up because I do understand both sides of it. Obviously we can’t just leave them there. Refugees do not choose to be born in a war zone. They do not choose to have their religion hijacked by extremists, they do not decide to flee their country for fun. I cannot imagine the horrors the people in the Middle East have faced recently but moreover, I cannot imagine living a nightmare and being told by the world “we won’t help you”. I also understand the fear of Canadians. Yes, it is going to cost you money. Yes, these are people you do not know. Yes, you are scared that they might bring the war here. But when it comes down to it, yes, they are people. Yes, they matter. Yes, they deserve to have the basic right of living without fear. In this Christmas season, the Bible story will be read all over the world, thousands if not a million times. But a lesser known part of the story has been all I could think about. Jesus, as a baby, was a refugee. Shortly after Jesus’ birth, Joseph and Mary received word that the King had ordered all baby boys to be murdered and thus were forced to flee their country in order to save their son. They went to Egypt of all places and keep in mind that the Israelites had quite the history with Egypt. It was probably the last place they wanted to go and the last place they would be welcomed. But they went. Not because they wanted to but because they feared for their lives. They lived in Egypt for several years. Imagine if they had been turned down at the border. Told “Go home, we don’t want you. We remember what happened the last time we had Israelites in our country”. Jesus could have been one of the children killed during King Herod’s reign. How crazy is that? This Christmas the pastor at my church said the one person he wouldn’t want to be in the Christmas story is the innkeeper that turned them away. I wouldn’t want to be the one to turn away a refugee out of fear. God understands the plight of the Syrian refugees and my only possible response is one of love and of hospitality. There are no winners in war. But there are heroes. I’m praying that Canadians will live up to our reputation as being the friendliest country in the world, because in some cases, the best hero is the one willing to be a true friend. As for the Hunger Games, it did sort of have a “happy ending”, as happy as can be after everything the characters had lived through. It was one of my favourite book series when I was in elementary school so maybe I’ll be able to watch it again sometimes and see it just for what it is. Or maybe not…I think I’d rather think anyways. I certainly learn a lot that way. Here it goes, my round two attempt at a movie review. And yes, I know that the category is listed as books and movies but as a second semester high school senior, reading for pleasure is a hard no. Not that I don’t want to, but even finding time to write a blog post or hang out with my friends is a struggle, let alone trying to plow through a 400 page novel. So, book reviews, I’m hoping will come someday when I have a bit more time on my hands. This week I went to see Pitch Perfect 2 not once, but twice. Yes, I know I’m crazy. The first movie is one of my absolute favourites of all time and I can pretty much recite it to you word for word. I was nervous about going to see the second one because what if it didn’t live up to my very high expectations? Thankfully it did. It was hilarious but also oddly heart-warming? I loved that the girls had to struggle with moving on in life while still staying connected to the friends and memories they made in school, something I’m currently dealing with as I move into my last month of high school. Penetonix making an appearance as the Canadian team? Genius. Also, Fat Amy, that is all. Everything Rebel Wilson does in these movies is hilarious. And of course, if a good a capella movie soundtrack doesn’t amuse you, I don’t know what will. Let’s be honest, the movie doesn’t have a very complex plot, but as a comedy, it was great. Kind of. The thing is, as much as I loved it, it also made me a little uncomfortable. I felt that a few of the jokes went just a little too far, past the so-called “acceptable” level of offensive humour and edging into the territory of just plain offensive. Now, others may agree or disagree with me on where that line lies (or even if it exists at all) but I had this slight moral struggle after going to see it the first time. Yet I went again. On the drive home on Tuesday night one of the girls I had gone to see it with made the comment that it was almost easier to swallow the crass humour because of how straight up it was. Other films will dance around topics. You know exactly what they are getting at but they don’t, if you’ll excuse me, have the balls to outright say it. 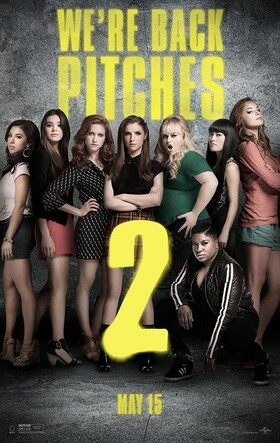 Pitch Perfect on the other hand, both the first and the second, is unabashedly racist and sexist to your face. It’s part of that absurdity that makes it funny. Still, how can I love a film series so much but not agree with some of the things it promotes? If someone I knew said those things in real life, I would so not be okay with it. I guess one thing to keep in mind is that it is a comedy. The things they are saying are said purposely to make people laugh, and yes, maybe even to get a rise out of them. The jokes I had a problem with are stereotypical and rude and it’s almost like they are funny just because they dared to say them out loud. Now, I will say, Pitch Perfect also has a secondary level of humour that you catch more of when you watch it more than once, jokes that aren’t so in your face which is one reason I like them. At the end of the day, I still loved the movie, I still went to see it again, I will still buy it when it comes out. Does that make me a hypocrite to support media that promotes values I don’t agree with? I don’t know. I really don’t have an answer. I just figured I would share my thoughts on a movie I waited anxiously to see and thoroughly enjoyed, even if it made me question what I find funny and why I find it so. Maybe I’m reading way too much into this anyway haha! What do you think? Have you seen the movie? Were there any jokes that you felt went too far? Am I a hypocrite?! Sound off below! Here’s the link to the trailer if anyone’s interested. This is the opening line of the movie The Imitation Game, which centres itself around the story of Alan Turing, a brilliant mathematician who cracked the Nazi enigma code during WWII. 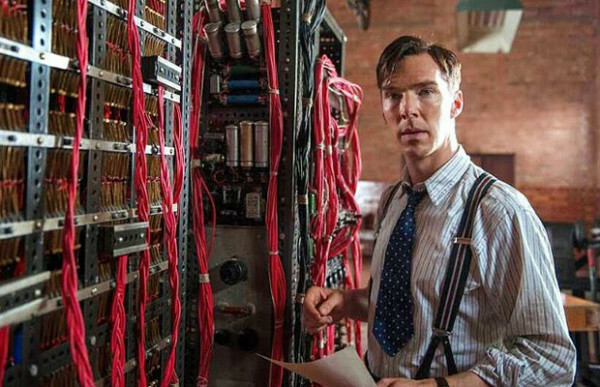 He and a group of other linguists and code breakers spend two years building a machine called Christopher capable of sorting through millions upon millions of possible settings for the enigma machine that could be used to crack intercepted Nazi radio communications. Turing is an eccentric character to say the least. Incredibly intelligent, fairly arrogant and socially awkward, he reminded me a bit of Sheldon from the Big Bang Theory. 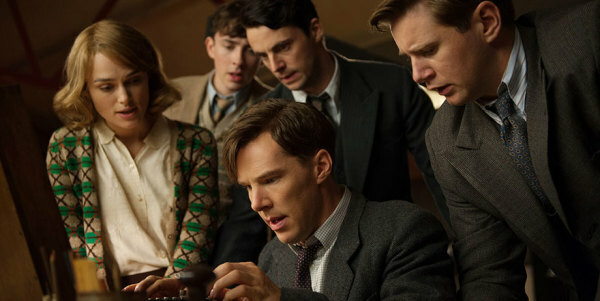 Played by Benedict Cumberbatch, the acting was really good and I found myself silently egging on the characters, totally engrossed in complexity of the enigma code and the puzzle of trying to solve it. When they finally did, I actually said “wow” aloud in the theatre. The whole concept appealed to my curiosity. The part that broke my heart was at the end. Turing is arrested for being a homosexual, fired from the job he loves, and put on government mandated hormone therapy that changes who he is, to the point where he can’t even complete a crossword puzzle. He ends up killing himself. I think we as humans are inherently afraid of the things we don’t understand. Most of us cannot even begin to fathom the way Turing’s brain worked or how he came up with the things he did. Why didn’t I know his name before today? I knew about Einstein and Churchill and Steve Jobs. Historians predict that the cracking of the enigma code ended the war 2 years sooner and saved 14 million lives more than if it had never been solved. And yet I didn’t even know the name of the man who did that, who was the first person to dream of a machine like the one I am writing on at this moment. But he was odd and he was gay. His was judged by his perceived shortcomings rather than praised for his incredible talents and because of that he was lost to our world too soon. Looking at his accomplishments in the 41 years he lived, who knows what he could have done if his life had lasted 60, 70, 80 years? We won’t ever know. The movie itself was incredible and so interesting to watch however more than that it made me think about the world I live in today. We consistently as a society look for ways to judge each other rather than admire each other. Who cares how talented someone is, they’re ugly. Who cares how intelligent someone is, I don’t agree with their lifestyle. Who cares how kind hearted someone is, they annoy me. And we isolate and push each other away instead of coming together as a community. What if we all helped patch the holes in each other’s weaknesses? Used each other’s strengths to overcome our weaknesses? I’m kind of off on a tangent at this point but it really broke my heart to watch the story of a brilliant man crumble because people couldn’t look past their own bias’ to see the good he brought to the table.